Peg and Jeremy are consistently one of Sonoma County's Top Producers since 1978, a Top 10 Sales Team in North America, & in the top 1% of Coldwell Banker agents worldwide. With over 50 years of combined experience selling property in the Northbay and Sonoma County, Peg & Jeremy have a wealth of knowledge in all types of real estate markets, including our current changing market where foreclosures and short sales have become the "norm." Their team allows them to handle multiple transactions presenting varying levels of challenge with ample coverage and ease. 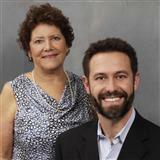 Over the past 31 years, Peg & Jeremy have helped hundreds of buyers & sellers achieve their real estate goals! On a personal note, Peg has been married to Cliff King since 1977 & together they have raised four children, Jeremy, Taylor, Lucas, & Cody in Petaluma. Active in their schools & sports programs while they were younger, now Peg is involved with Habitat for Humanity, mentoring new realtors and the joys of being a Grandmother! Jeremy joined Peg King & Associates in 2005, after graduating from Point Loma University in 2002. Jeremy obtained his Real Estate License and joined Coldwell Banker in San Diego. Born and raised in Petaluma, he has set down roots with his wife Elisa and can give an insiders look to this wonderful community and all that it has to offer. Jeremy is dedicated, hardworking, and always put his clients' needs first. Jeremy enjoys being active in the community, coaching t-ball, traveling, basketball (watching & playing), reading, and chasing around his daughters Scarlett and Juliet, son Grady!